Quinoa Tabouleh, one wholesome salad for the whole family! Easy, Breezy, Lemon Squeezy! 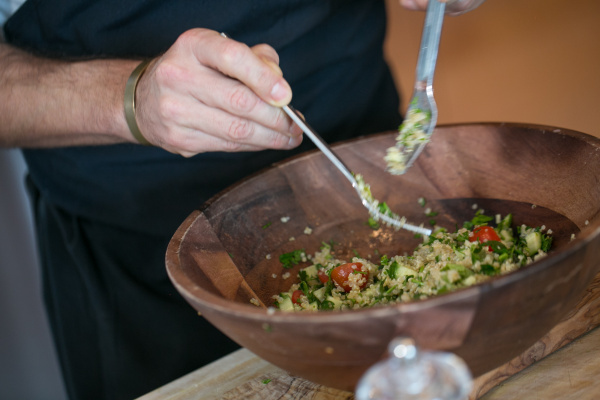 Quinoa tabouleh is a no brainer. Once you replace the cracked wheat with quinoa you got yourself the most healthy salad meal, full of protein, vitamins, minerals, and fibers. The fresh flavor of all the herbs will fill up your home and your senses with happiness. Mix all the ingredients, season to taste and enjoy! The secrets to the perfect homemade Spiced Kale Chips.